Looking for a lightweight, perfectly crafted, durable, and IBJJF approved Gi? Look no further than Vulkan Ultra Light Gi. 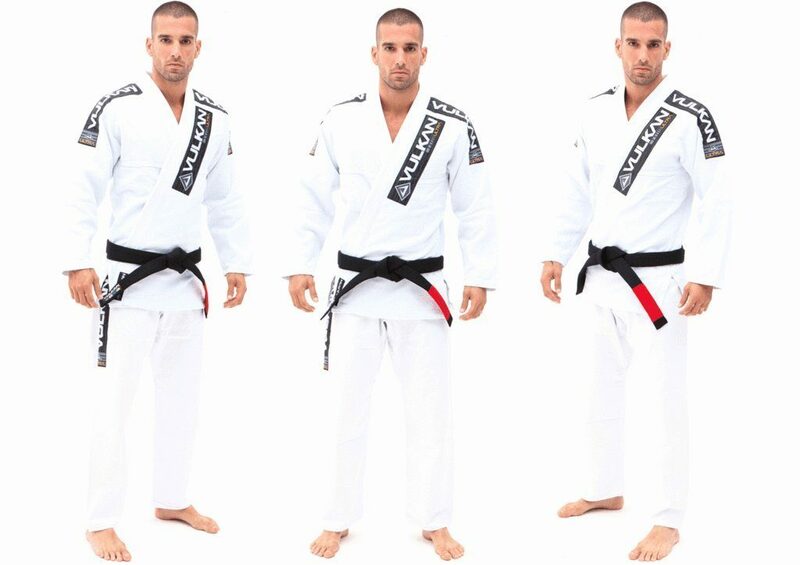 It is one of the best BJJ Gis in the market that offers an overall satisfaction. It’ll keep you light, well-ventilated, and trendy looking. I have been using Vulkan’s Gi for last 7 years and never felt cheated or unsatisfied with any of the products. The same holds true for Ultra Light Gi. 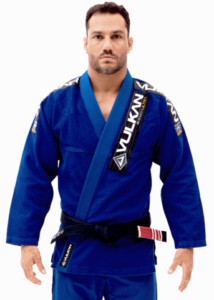 Vulkan Gis are one of the most well-known BJJ Gis on the Market. In my early days of Brazilian Jiu-Jitsu, the Vulkan Ultra Light Gi was a trendy new Jiu Jitsu Kimono on the scene, that was different than most big and bulky Gis of the time. It had a fitted slick design that I always liked and was just so much better than the Gracie Barra Standard Kimono I owned. The Vulkan Ultra Light Gi was my first Gi that I really loved and every 2 years I would buy a new one. To this day, 7 years later, the Vulkan Gi is part of my arsenal of training Gis I use consistently. Even though the designs of Brazilian Jiu-Jitsu Gis have changed a lot over the years and many Bjj Gis are light weight and beautifully designed and tapered, the Vulkan BJJ Gi is as relevant today as it was back when I first started BJJ. Since I already love this product so much, I thought it’ll make a perfect sense to write an honest Vulkan Ultra Light Gi review. I’ll talk about the benefits, what I didn’t like, and if it’s worth buying in 2019. The Ultra Light Vulkan Gi is amazing for training if you train in very hot weather, are prone to claustrophobia, heat adverse or sweat a lot. I felt that with the Vulkan Ultra Light Gi, I can train harder with more intensity and don’t feel as weighed down as with other heavy fabric Kimonos. Sometimes, I have bouts of anxiety or heat sensitivity if I train too hard with other Bjj Gis, but with the Vulkan Gi, I always feel great, light, and well-ventilated. The jacket itself is very durable with a solid collar and good cotton fabric. It takes 1-year or more of hard training before you ever see any real wear and tear on the Gi. During a good rolling session, you will love its soft cotton and cozy feel and the good ventilation. I also feel that it doesn’t hurt you as much as the tougher heavy fabric kimonos that tend to give me Gi burns everywhere if I roll with some tough guys. The Sleeves of the Vulkan Ultra Light Gi are a little bit longer than usual which is great if you are a lanky guy like me. I went with an A1 that fits me perfectly at 155 pounds and 5 feet 8 inches. The Vulkan Ultra Light Gi is IBJJF (The International Brazilian Jiu-Jitsu Federation) approved. If you dream yourself participating in some of the biggest Brazilian jiu-jitsu tournaments in the world, you can take part with this Gi. Lastly, the best thing about the Vulkan Gi is the ability to travel with it. The Vulkan BJJ Gi is so light and literally occupies the most minimal space you can expect for a Gi in your luggage. I traveled to many countries in Europe with only a backpack and my Vulkan BJJ Gi fit perfectly in my backpack. Also, the Gi dries very quickly that even if you hand wash and hang it, by the next morning the Gi is ready to use. The Vulkan Ultra Light Gi is perfect for hot locations like Brazil where training in some of the academies feels like training in a sauna. The only disadvantage of the Vulkan Gi is probably the pants. The pants feel great and are cotton, so they are soft and lightweight. But the knee pads lack reinforcement. The new generation of Gis have ripstop technology which is much better for stopping rips and makes these pants seem outdated. I think it isn’t a huge issue because after a year of use a rip or tear seems normal for cotton pants. Some people love the way cotton feels rather than ripstop material, so I don’t think it’s a big deal. You can buy ripstop pants for around $30 dollars if you are truly worried. Another issue worth mentioning is the sizing. If you’ve read our Best BJJ Gi article, you’d know that each and every brand uses a different sizing. 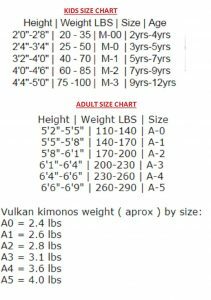 The Vulkan Gi has a different sizing factor than other Gis, so you should check the below Vulkan Gi size chart before ordering. Apart from these two, there aren’t any noticeable cons to Vulkan Ultra Light Gi. It scores a whopping 4.4 stars rating on Amazon, so that explains the quality. As discussed, I’m 5 feet 8 inches in height and weigh around 155 LBS. So, I went with A1 size which fit perfectly to me. You should measure your height and do a weight scale to get the perfect size Gi. For kids, I’d recommend going for a size up to have that extra space for their growth. Is The Vulkan Ultra Light Gi Worth it? I would highly recommend the Vulkan Ultra Light Bjj Gi if you are after a high-quality, very lightweight, durable, and comfortable Gi. It sells on Amazon for only around $90 for kids and $150 for adults – well worth all the training you’ll do with it. Like I mentioned earlier, if you are averse to heat, sweat a lot, need a good summer training Gi or claustrophobic, go for the Vulkan Ultra Light Gi. If you want something heavier, you can always choose the Vulkan Pro Light Gi. I also find that for a lankier person both are a great fit. Vulkan Ultra Light Gi is not for you if – 1. you completely swear by double weave thick Gis that have a heavy feeling. 2. You want a better pants with ripstop technology. In that cases, I’d recommend you check out our Sanabul Gi Review which is a great product and affordable. Otherwise, check out the Vulkan Gi Amazon page, read all reviews and product details for more information. For a limited time, they’re giving you access to free starter videos to help you impress the instructor – don’t miss on it. I hope you enjoyed reading through my honest Vulkan Ultra Light Gi Review. If you did, please share this article with your friends and BJJ lovers.